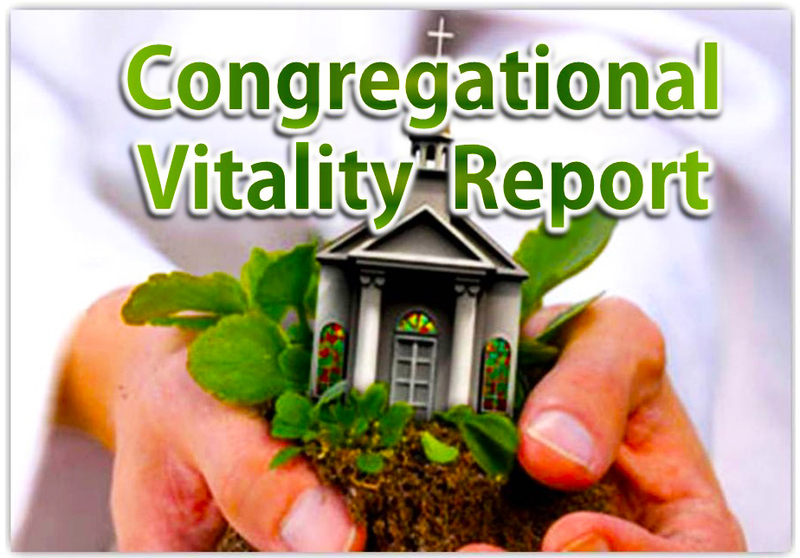 The 2014 Congregational Vitality Report, which was presented to the Council of Bishops earlier this month, reveals some reason for encouragement, though the overall news on the church vitality front is decidedly mixed. The report showed U.S. church starts are on the rise — from 116 in 2012, to 145 last year. During the past two years, 688 new faith communities have started in the denomination’s central conferences — church regions in Africa, Asia and Europe. Faith communities include small worship groups that may never grow big enough to be considered churches. 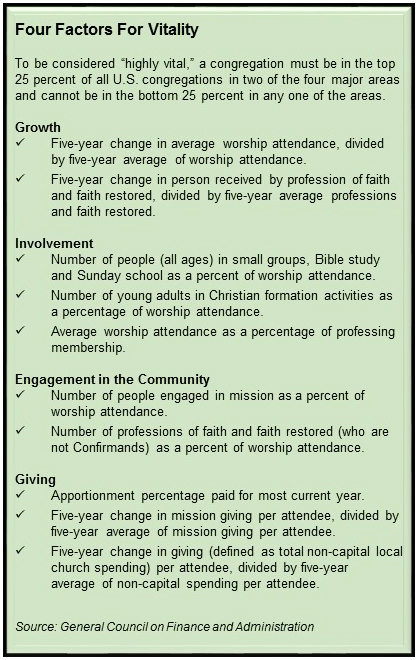 In 2012, we grew in professions of faith, small group participation, mission participation and mission giving. However, the numbers from 2013 tell a different story as congregational vitality experienced a dip. The percentage of highly vital congregations slipped seven points to 27 percent. Which means that almost three out of four United Methodist Churches in the United States are struggling in our mission to make disciples of Jesus Christ for the transformation of the world. The numbers are slightly better in the CTC, where we experienced a two percent drop (32 percent in 2012 to 30 percent in 2013). The only areas of growth overall were realized in small group participation and mission giving. The report also shows that worship attendance is growing in only about a third of U.S. churches. In 2013, six U.S. conferences increased in highly vital congregations, while 47 decreased. Ten conferences increased the percentage of congregations growing in worship attendance, while 42 conferences saw declines (The CTC dropped 1 point – 42 to 41 percent). Overall, U.S. churches saw a two percent drop in worship attendance. Even with the 2013 drop in vitality, the denomination is ahead of where it was in 2010, when it began its current focus on vital congregations. That year, only about 14.8 percent of United Methodist churches in the U.S. were identified as highly vital. “We saw good progress immediately after conferences and congregations set goals,” Bishop Schol said. But he added other factors could have contributed to last year’s decrease, including clergy retirements. To reverse decades of declining U.S. membership, denominational leaders say United Methodists will need to maintain focus on congregational vitality. Planting churches is part of that focus. That began to change in 2008 with the founding of Path1 New Church Starts, part of the denomination’s Discipleship Ministries. Path1 works with conferences to provide coaching, training and other resources for new church developers. The Rev. Candace M. Lewis, Path1’s executive director, said her division helps “the denomination see the big picture” as it goes about starting new faith communities. Bishop Lowry, who chairs Path1’s advisory board, reports that the group’s work has made the biggest difference in conferences too small to hire a full-time new church development staff person. It’s also helping the denomination stay focused on cultivating church planters. One of the biggest challenges the denomination has faced in recent decades is the result of Methodism’s early success. In the 19th century, the movement spread rapidly across the United States with new churches sprouting in just about every human settlement. Today, about 60 percent of U.S. United Methodist churches are in rural communities. While many rural churches are doing vital ministry, about 80 percent of the U.S. population now lives in urban areas. Bishop Lowry believes that starting churches requires more than “following the rooftops” to new leafy, affluent suburbs. He says that United Methodists and Path1 have collaborated to start fruitful congregations in settings as varied as bars and prisons all across the connection, including right here in the CTC. Between 2008 and 2012, United Methodists started 684 congregations in the United States, exceeding the denomination’s goal of 650. Most of those churches are going strong, Rev. Lewis said, but Path1 is still working on tracking closures of the new congregations. By the end of 2016, the goal is to start 1,000 more. Leaders are using various strategies to start congregations. They can start as an additional campus of an existing congregation or receive support from a congregation or group of congregations. They can target a specific ethnic or language group or even be what the denomination calls a vital merger, when two or more churches consolidate into a new congregation. Often these vital mergers are finally free from costly, difficult-to-maintain buildings and better able to focus on ministries. The denomination is still closing more churches than its opening. In 2013, 375 churches closed, according to United Methodist Council on Finance and Administration statistics. *Heather is a multimedia news reporter for United Methodist News Service. newsdesk@umcom.org.